Here I Am... And Look Who Is With Me - Using the words and music of Lawrence Siegel's composition, KADDISH, students will respond to the call of Holocaust survivor voices. Twenty four lesson plans are available, along with supporting materials. The CD-ROMs include the score and libretto of the movement to which the lesson relates, along with audio files of the World Premiere performance. Litany/Kaddish Prayer - For those intersted in performing Litany and Kaddish Prayer we now provide the score, conductor's notes, and supporting material on CD-ROM. Litany is the the turning point in the Kaddish narrative. It begins the final section of the work, Tikkun Olam, (Repair of the World) meant to find some way to move forward from the ashes. It consists only of spoken words, and only these words: the names, dates and places of birth, dates and places of death of 2,037 from among the millions who perished in the five extermination camps of the Nazis during the height of the Holocaust: 1942-44. Tricinium has produced recordings which can serve as an excellent introduction to our work. All Go Forward and Back! 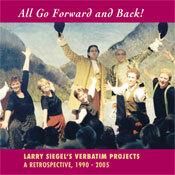 a retrospecive of Verbatim Project works, recorded with first class traditional players. 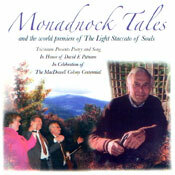 Monadnock Tales, featuring Edie Clark's book length poem in a chamber ensemble setting, with Tom Putnam narrating. This CD also includes The Light Staccato of Souls, encompassing three winning entries from Tricinium's poetry contest on the theme of community. 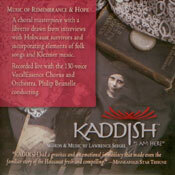 Kaddish, World Premiere Performance recorded live with the 130-voice VocalEssence Chorus and Orchestra, conducted by Philip Brunelle. Visit the individual pages to learn more about these recordings and listen to excerpts.